What's Hiding Inside of This Ginormous Fake iPhone 4? Hey look! Is that an iPhone you're holding? No, no, of course not. Nothing this fat could ever be an Apple product, or even pretend to be one. But it is really cool. Literally. 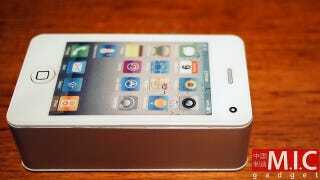 This fake white iPhone 4 is an air cooler by M.I.C. Gadget. Underneath its massive, easily pierced veneer is a fan and space for a sponge. Wet the sponge a bit and it'll blow cool water vapor your way. It's the original AC. It even charges via USB cable.